Local veteran NHRA Pro Stock Motorcycle racer Sam Hurwitz, of Newton, Massachusetts, has entered the New England Nationals this weekend. He’s been motorcycle drag racing for 27 years now and Sam first qualified in the NHRA P/S motorcycle ranks in 1999. Sam raced within the NHRA during the years 2001 to 2005, when time and money were available. Sam Hurwitz of Massachusetts, has entered the inaugural NHRA New England Nationals in Pro Stock Motorcycle for the June 20-23, 2013 event. 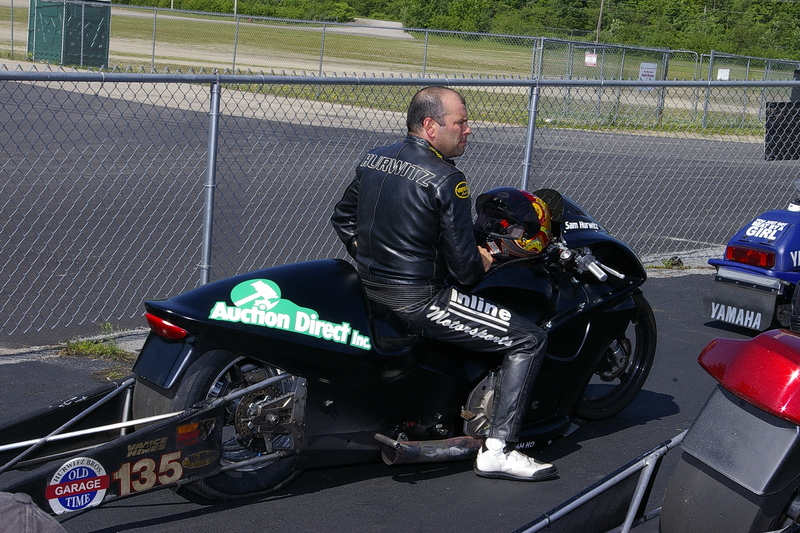 Sam is seen here in local Top Bike competition at New England Dragway, located in Epping, NH. Tom McCarthy Photo. For this weekend’s race, Sam has rented a bike from Shawn Gann, an NHRA P/S bike racer from Stoneville, N.C. Shawn has a career best of 6.878 @ 194.35mph. Sam has indeed rented a machine capable of running winning numbers. This season, during Sam’s racing at New England Dragway in the local track’s Top Bike program, Sam has been recording regular seven second elapsed times at over 190mph. There is no doubt in local racers minds that Sam is quite capable of mounting a competitive effort for this race in NHRA P/S Motorcycle. 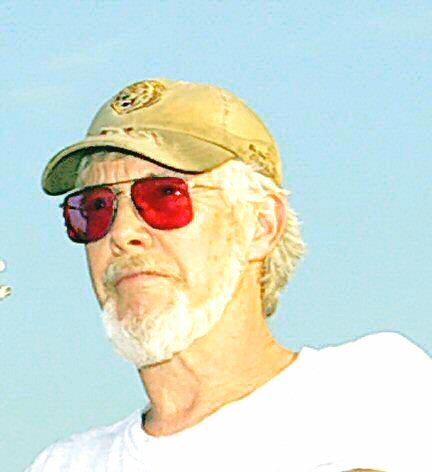 Crew Chief for Sam’s efforts this weekend will be Rick Stetson of Northboro, Mass who has been in and out of NHRA P/S bike racing as a racer and tune-up wizard since the mid 1980’s. Mr. Stetson knows what it takes to win an NHRA “Wally,” he’s been there and done that. Rick has tuned various racers’ bikes during the last four decades resulting in championships with various racing sanctions as well as world Land Speed Records. Mr. Stetson himself has a LSR of over 200mph in his shop, Harry’s Machined Parts, located in Northboro, Mass. Sam’s crew chief for the race will be Rick Stetson, of Northboro, Mass. Rick is a former NHRA Pro Stock motorcycle racer with more than one NHRA win to his credit. He’s also a noted engine builder and tuner with over four decades of experience. Assisting in this weekend’s racing efforts by Sam Hurwitz will be New England Dragway Top Bike racers Ed Hughes of Lowell Mass, and John Civitarese of Attleboro, Mass. Ed, a local track champion, and John a close racing associate of Sam’s, will be attending pit duties for Sam and Rick during the busy race weekend. As the racers roll their rented Pro Stock motorcycle into NHRA Tech this weekend they know full well they are doing so facing the multi-million dollar teams in a David Vs Goliath scenario. Local racers and fans are already a buzz, knowing Sam is quite capable in the driver’s seat and Rick Stetson is also capable of tuning the bike for every ounce of power it can produce. This will be a most interesting race weekend for Sam’s Crew Chief – Rick Stetson. He’s butted heads with Vance & Hines Racing and Star Racing on many occasions. Mr. Stetson loves playing the roll of the spoiler. He’d like nothing better than to upset the apple cart in NHRA P/S bike. Also for their many years of efforts, both Sam and Rick would love once, just one more time, to stand in that NHRA winners circle with the Wally held high in Sam’s hand. If it were to happen, it would be the win of a lifetime for these dedicated local veteran racers who are out to prove, dreams really can come true. Good luck to Rick and Sam in PSB racing this weekend at the New England Nationals!